I often wonder how poets with incredibly dark content handle reading them out loud for an audience. I heard Matt Rasmussen read recently at the Loft, and was struck by his genuineness and self-conscious humor, especially when reading from his debut collection of poems which largely deals with his brother’s suicide. He’s asking us to take a dark plunge with him into a murky place of loss. And we do, because he’s so damn inventive in his language and outlook. It is no surprise that this book won the Walt Whitman Award of the Academy of American Poets. Rasmussen’s use of dark and bitter humor adds yet another dimension to the book, as seen in “After Suicide” (one of a few poems with this same title): “At the party celebrating me, / you always show up late / and dead. Ding-Dong. / Ding-Dong. No one / gets the door, we know / better.” Another perspective that Rasmussen sheds light on is what other people are thinking and the rumors that start. These different perspectives are what make the book digestible in all it’s dark moments—we aren’t wallowing with the poet in suffocating depths. Instead, we’re perched on the poet’s shoulder as he circles around a need for closure, searching in any place or emotion that can be found. 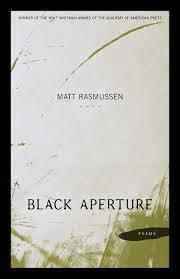 Rasmussen gives us occasional breaths of air above water with poems not related to his brother before we dive back in. Rasmussen expertly uses themes to facilitate and connect the different angles in a sense of overall cohesiveness. One of these themes is the close inspection of guns throughout, which ends with the wishful image of a rifle being broken down in the ending poem, hinting of closure that hasn’t quite happened yet. Another reoccurring image is a deer being hunted that resurfaces in a handful of poems. These themes act as a touchstone, allowing us some space from the raw subject matter while connecting each segmented perspective to the overall journey of the book. and even now. I’m sorry we are not here, I began. Rasmussen’s work has been published in many places, including Poets.org, Gulf Coast, and Paper Darts. In addition to being a poet in his own right, he is the founding coeditor of poetry press Birds LLC. Since this book was just released, he’s been popping up in reading line-ups all over the Twin Cities area—I encourage you to go to one and listen. In fact, I’ll make it easy for you: Rasmussen is reading at our Hazel & Wren copresented Maeve’s Session on July 11 at Maeve’s Cafe in Northeast Minneapolis (other readers include Jeffrey Skemp, Sarah Fox, Sarah Certa, and Caitlin Bailey). Rasmussen is also coming to Boneshaker Books in August, reading alongside Mark Berriman and Carol Connolly (St. Paul’s Poet Laureate). Who are some other poets with intensely dark work who are able to lighten the load through form, approach, or language choice?